Shopping in E-commerce has become a daily activity for residents in various countries. Various types of goods and services can be easily purchased online (on the network), using e-commerce platforms or through social media. Consumers benefit greatly from the existence of e-commerce facilities because it saves time, lots of choices, and is more informative. In Indonesia, consumers or e-commerce users are estimated at 50 million people, only one-third of 143 million internet users today. Users of e-commerce will certainly increase in the coming years. The use of the internet for trading is not only done between sellers and domestic buyers, but also between sellers and buyers from different countries. Cross-border e-commerce is growing because consumers in a country want to buy goods online from other countries to get products that are better than those offered in their own country, want to see more choices, or want to buy from a trusted store/seller the authenticity of the product being sought. According to Accenture's study, as quoted by Quan Nguyen (2017), in 2020 there will be 2 billion online buyers or 60% of all global consumers. They will buy 13.5% of the value of their retail consumption online. That means there will be 3.4 trillion US dollars worth of Gross Merchandise Value-GMV. About 900 billion US dollars (22%) of this value will be spent in other countries online. Can Indonesia achieve enough of this cross-border e-commerce value? Several neighboring countries have practiced cross-border online trading for quite a long time. In Singapore, 55% of the value of national e-commerce is done with other countries, far above Japan (18%) and South Korea (25%). One of the reasons for the high cross-border online trade in Singapore is the provision that the purchase of imported goods that are not subject to tax (de minimis value) is quite high at 400 Singapore dollars. This is certainly an opportunity for Indonesian e-commerce businesses. However, there are several obstacles that must be overcome to make Indonesia's cross-border e-commerce as advanced as Singapore, Malaysia or Thailand. According to the APEC Business Advisory Council and the University of Southern California (2015), the scarcity of educated personnel who are experienced in global trade while mastering e-commerce business is a major obstacle. Another obstacle is the low level of trust most consumers have on cross-border online payment systems. There are concerns about fraud or problems in purchasing online with parties in other countries. Language barriers and the disclosure of various cases of bully investment may be the cause of this problem. Credit card penetration in Indonesia is still low, around 15%, reducing the attractiveness of foreign businesses to sell goods here. In addition, there are not many local marketplaces that serve cross-border trade, and there are still many business people who have not been involved in e-commerce in Indonesia. The Ministry of Communication and Information said that there were at least 40 million of the 59.7 million micro, small and medium enterprises (MSMEs) that had not used e-commerce facilities. 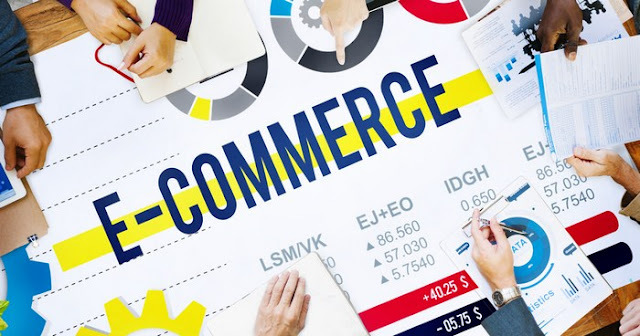 MSMEs that have been selling on various e-commerce platforms are still likely to explore online trading, not thinking in the direction of cross-border trade. The smooth delivery and storage of goods on a large scale is an obstacle to the growth of online business across countries. The cost and time of delivery of goods greatly affect the price that consumers must pay. Also, there are still many residents (47%) living in rural areas, some of which have not been reached by smooth infrastructure and facilities. The opportunity for villagers to do business online is still very limited, even though the potential is very large. Although the government has tried to improve the national logistics system, the customs process is still considered complicated, partly because there are still several agencies that have the same authority to grant export and import licenses for certain commodities. Furthermore, the speed and reliability of the internet is an important requirement for e-commerce growth. The extent of the geographical area is an obstacle for the government to provide equitable and affordable broadband internet infrastructure (fixed and mobile). Currently, Indonesia and several other emerging markets such as Turkey, Argentina, India, and South Africa are experiencing financial turmoil in the form of a relatively deep decline in the value of the currency. Common causes are rising US interest rates and US-China trade wars. In addition, these countries also experienced a large current account deficit. Thus, one effective way to overcome financial turmoil is to increase exports while controlling imports, in addition to structural transformation. Increasing exports can be done by diversifying commodities and export destination countries. In addition, increasing the number of exporters also has the potential to increase export value. Increasing exporters can be done by opening a wider door for domestic businesses to export through e-commerce platforms. Indonesian entrepreneurs, especially MSMEs, can offer cultural, culinary and creative arts products that have not been widely known in other countries. 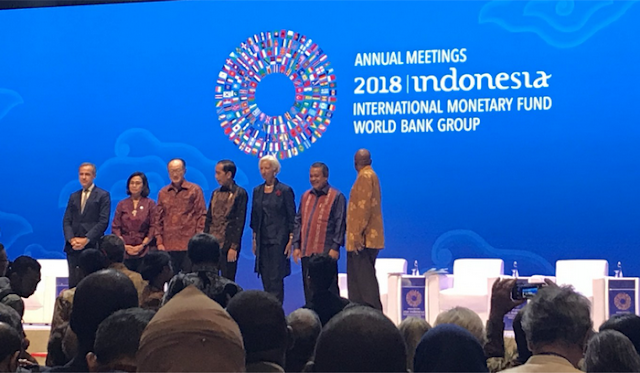 Considering the many constraints that limit the development of cross-border e-commerce, the IMF and World Bank Annual Meetings in Bali are now expected to provide solutions to it. Some things that can be donated to MSMEs related to cross-border e-commerce are the need for agreement between the parties to simplify and harmonize cross-border trade regulations, including e-payment systems, taxation, consumer protection, customs, and so on. Then it is necessary to encourage bilateral or multilateral cooperation to make it easier for MSMEs in each country to be involved in cross-border e-commerce. For example, working together to build warehousing facilities to store food or craft items near the international airport. The IMF and World Bank are expected to accommodate the interests of participating countries, especially developing countries, regarding cross-border trade in services to be forwarded to relevant world-level institutions, such as the World Trade Organization (WTO). Furthermore, the IMF and World Bank meetings need to establish the framework and targets for the progress of digital economic development, especially cross-border e-commerce. The existence of a joint agenda for the development of measurable cross-border e-commerce will increase global trade that is more dynamic, inclusive, and a solution to overcome and prevent financial turmoil in the future. These efforts are believed to encourage stable economic growth while reducing poverty in developing countries, two things that become the mission of the IMF and World Bank.